As on-location, natural light photographers, we are bound to be faced with some less than fabulous weather once in a while. We get really sweaty and hot in the summer, we get wet when it rains and in this case, our fingers freeze to the bone in this crazy Canadian winter weather! But we really have to hand it to the wonderful couples we work with who brave rain, cold, heat and other poor weather situations just to make sure their photos turn our perfectly! Meet Meaghen and Marco! A wonderful couple who we will get a chance to spend even more time with during their wedding this summer. 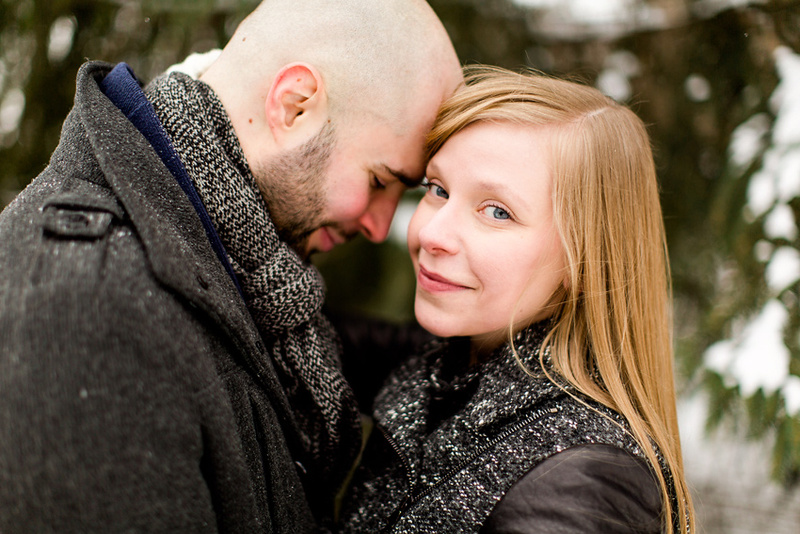 We scheduled in an engagement session nearby in the woods but little did we know that it would be crazy crazy cold! No matter…Meaghen and Marco bravely hugged and smiled the entire time we spent with them. Both Magda and I were so thankful and in awe but it was obvious that their relationship distracted them from Old Man Winter! Maybe it has a little to do with Marco being a diehard Habs fan? Here are a few of our favourite images from that cold day and you’ll see more photos of Meaghen and Marco in the summer. Till then! We were very fortunate to have photographed wedding so many times at the Cumberland Heritage Museum this year. It’s a place that offers a big variety for photos, it’s got old buildings, fields and at this time the trees were spectacular too. Which is why we were really looking forward to Lisa and Sean’s wedding which was to take place in the super tiny but adorable steeple on the grounds! It ended up being a beautiful day even though it drizzled a little bit. The steeple filled in with friends and family and before we knew it, Lisa was walking down the isle. It was very dark in there but we managed to make it work! We were not concerned by anything because Lisa’s smile brightened any potentially difficult photo opportunity and in turn also put a huge smile on Sean’s face. The reception was at the River Rock Inn in Rockland and it was a really awesome party. I don’t think we’ve seen so many tears of happiness from a bridal party! Well, this winds down Bartek & Magda’s 2014 wedding season! It’s been an incredible blast working with fantastic couples and we can’t wait what 2015 will have to offer. Lisa and Sean, thank you for inviting us to be a part of your day and we hope you love these photos as much as we do! As usual, we leave our readers with our favourite images from your day as well as a slideshow. Enjoy! It’s always exciting when we hear that a couple will be getting married at a place that’s special for their family. Meghan and Steve did exactly that, and decided to get married in Magog where Meghan’s family has a beautiful waterfront property. It was the perfect place not only because of the water or the perfect forest but because they clearly felt in their element and at home! This serene nature setting was ideal for friends and family to take in the spirit of the day, relax, have fun and most of all celebrate Meghan and Steven’s wedding! Meghan and Steven tied the knot and had the wedding reception at the beautiful Hermitage Club in Magog, Quebec. The intimate ceremony was immediately followed by a delicious cocktail outside complete with freshly shucked oysters and other seafood. With a crowd like Meghan and Steve had, it was no wonder the night was fantastic. A teary flash mob song by the family, touching speeches and a lot of dancing finished off the perfect day! Meghan and Steven, thank you for trusting us to capture your memories that day! It was a real pleasure spending time with you and your family and we wish you a lifetime of happiness. Here are our favourite photos from your day as well as a slideshow! Fadoua and Carlo knew exactly what they wanted from the very beginning. After falling in love with our work, they came over and we ironed out all the details super early on! That’s the kind of guy Carlo is. He knows what he wants and will do anything to make sure it happens…including getting his beautiful bride Fadoua! I think it’s fair to say that Carlo has a very special relationship with his favourite soccer team! But after seeing Fadoua and Carlo together on their wedding day, it was clear his love for Fadoua reached far beyond anything else in his life. The intimate wedding ceremony was under a tent at the Fino Restaurant here in Montreal. It was a rainy day, but we didn’t let that stop us from capturing the bridal party and the newlyweds at the always beautiful Westmount Conservatory Greenhouse. After a very fun photo session with everyone, we headed over to Buffet Roma. It was a really fun night complete with the most energetic dancing MC we’ve ever seen! Fadoua and Carlo, thank you for having us part of your special day and we hope you enjoy some of our favourite moments from your day below. We first met Sareda last year when she came here to Montreal for a super fun bridesmaids photo shoot. You can imagine how it warmed our hearts to see an email from her this year asking if we would be her wedding photographers in 2015! Before that big day comes, Sareda and Calvin wanted us to come down to Ottawa and take them on a pre-wedding photoshoot with all these beautiful fall colors still on the trees. We took them around the beautiful area of Rockliffe where they used to come for long chats when they dated. Fall can sometimes be a tricky time to photograph because you never know how long colors will stay up but we were thrilled to see bright oranges, reds and yellows beaming from the trees around us! We can’t wait for their wedding but in the meantime here are our favourite photographs from our time spent with Sareda and Calvin!